Good nutrition contributes to the development of physical and mental potential. It also prevents acute and chronic illnesses. 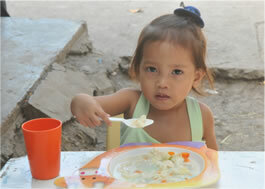 In developing countries such as the Philippines, however, nutritional deficiency is prevalent most significantly among children of poor families. Inadequate nutrition is a primary cause for many of the students in the country’s public schools not to fully realize their potentials. 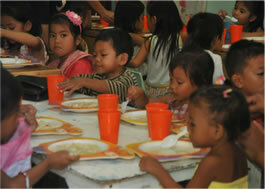 The Villar SIPAG currently runs feeding programs in the following areas: Las Piñas; Muntinlupa; Tondo, Manila; Sasmuan, Pampanga; Iloilo; and Bataan. Volunteers begin cooking early in the morning in order to have hundreds of bowls of hot chicken macaroni soup ready for the 9:00am recess. They resume cooking right about noon time for the 2:00pm feeding schedule. Bread and fruit juices are likewise served. 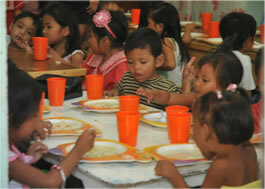 The feeding schedule runs twice a week in three areas simultaneously, benefitting up to 1,200 children in each site. Believing that it is always best to teach people how to fish and feed them for a lifetime, instead of simply giving them fish for the day, the foundation runs the feeding program to provide the immediate relief to the hunger problem of the children. 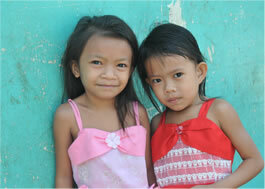 Meanwhile livelihood programs are actively pursued across the country.